The discourse surrounding the theory and practice on migration in arts education in Germany is shaped by various terms and concepts. The German arts education manual references integration, cultural diversity or multiculturality, interculturality, polyculturality and transculturality (Keuchel S, Wagner E (2012) „Poly-, Inter-und Transkulturalität“. In Bockhorst H, Reinwand V-I, Zacharias W (eds) Handbuch Kulturelle Bildung. kopaed, München, 252pp, 2012), while more recent discourse has seen the terms post-migration or diversity appear. A content analytical study will therefore be carried out using selected texts to examine which arts education actors from politics and practice, science and associations use which of these concepts and which imperatives are associated with the respective concepts, especially in the field of culture education and arts. Bolten, Jürgen. 2018. „Interkulturalität neu denken: Strukturprozessuale Perspektiven“. In Migration, Diversität und kulturelle Identitäten. Sozial- und kulturwissenschaftliche Perspektiven, ed. Hans W. Giessen and Christian Rink. Stuttgart: J.B. Metzler (will be published on 10.05.2018). Advance online publication. http://www2.uni-jena.de/philosophie/IWK-neu/typo3/fileadmin/team/juergen.bolten/1610_Interkulturalitaet_Strukturprozessual.pdf. Federal Ministry of the Interior. 2017. A Leitkultur for Germany – What exactly does it mean? A contribution of Federal Minister Dr. Thomas de Maizière to the question, “what holds us together at the core”. Available at: https://www.bmi.bund.de/SharedDocs/interviews/EN/2017/namensartikel-bild.html. Accessed 16 Feb 2018. Foroutan, Naika. 2015 Post-Migrant Society. Available at: http://www.bpb.de/gesellschaft/migration/kurzdossiers/205295/post-migrant-society. Accessed 20 Feb 2018. ———. 2016b. Arts education in the age of cultural diversity – A basis to gain cultural identity in a risk society. 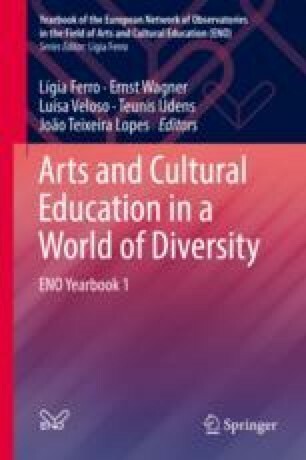 Available at: https://www.kubi-online.de/artikel/arts-education-the-age-of-cultural-diversity-a-basis-to-gain-cultural-identity-a-risk. Accessed 16 Feb 2018. Malik, Kenan. 2015. The failure of multiculturalism. Community versus society in Europe. Foreign Affairs, March/April Issue. Available at: www.foreignaffairs.com/articles/western-europe/failure-multiculturalism. Accessed 16 Feb 2018.